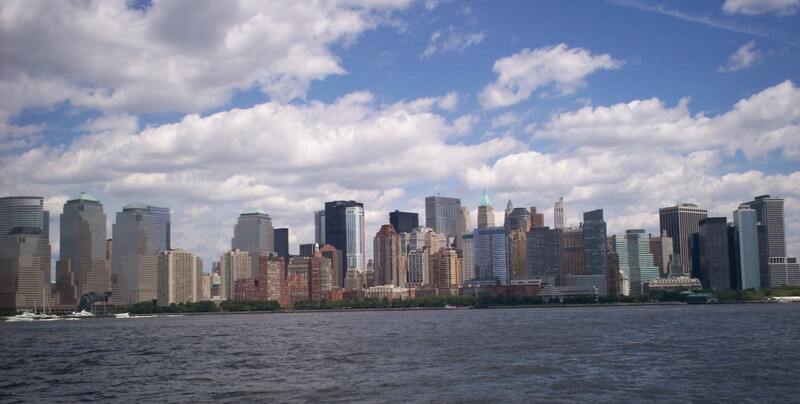 Our 2010 Road Trip, Part 9: New York, Not Yet « Midlife Crisis Crossover! A lot of what’s visible here is Wall Street rather than all the most beloved Manhattan skyscrapers. In the wake of the 2008-2009 recession we nonetheless tried to draw inspiration from the view rather than glare at it in middle-class indignation. 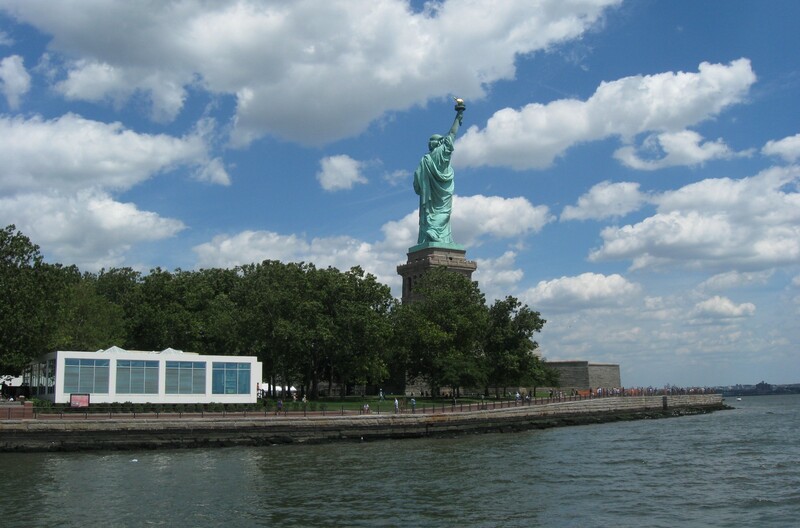 When we decided to devote one day of our ostensible Philadelphia vacation to visiting the Statue of Liberty a reasonable distance away, we had no idea what to expect from the journey. We certainly didn’t envision it as a prequel to future vacations. And yet, there we were, and there it was. After the record-breaking nine-day epic that was our 2009 trek to the farthest reaches of South Dakota, we decided to scale back in 2010 with a shorter drive in a different direction. 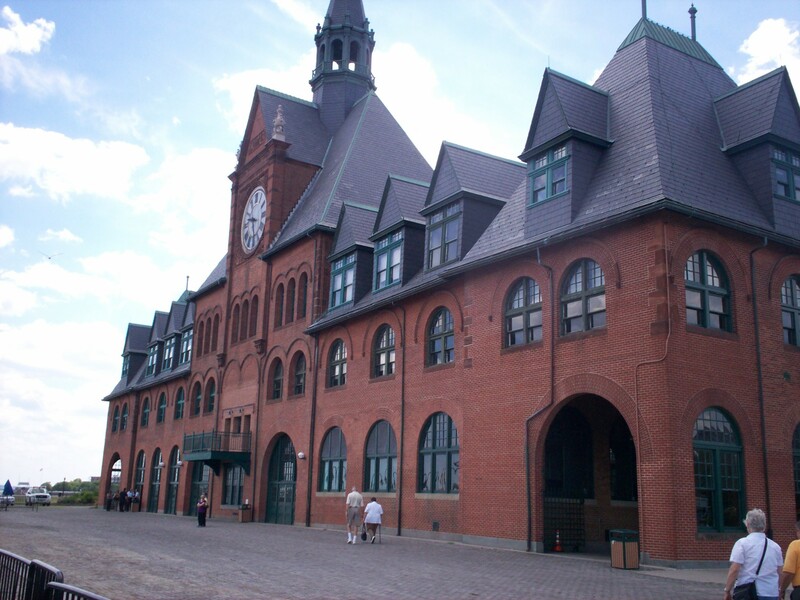 We previously drove through the corners of Pennsylvania in 2003 and 2004 — through Washington in the southwest corner on our way to Washington, DC; and through Erie in the northwest corner on our way to Niagara Falls. This year, that extra-large wooded state would be the center of our attention. As one of America’s original 13 colonies, Pennsylvania contains multitudes of U.S. history and authentic places and things from centuries past. For the three of us, we figured it would do well. Anne is a big history buff. I’m willing to drive just about anywhere within reason. My son would be dragged along for whatever ride until such time as he developed a separate life and identity. 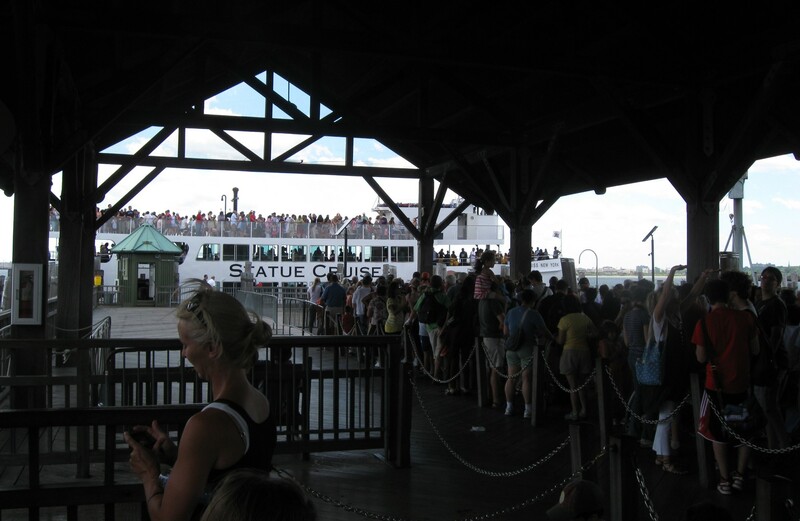 Once we’d had our fill of Lady Liberty, we returned to the dock to await the return ferry. 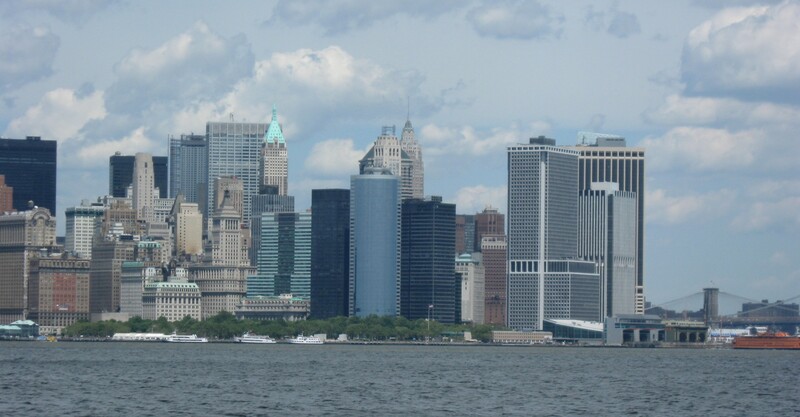 The New York and New Jersey ferries each have dibs on one side of the dock. Unsurprisingly, the New York side is partitioned to hold five times as many passengers as the New Jersey side. Their ferry arrived right on time. Ours arrived fifteen minutes late and bumped against the dock as if it were drunk. The line to the return ferry back to NYC. If you’re looking to save time and aren’t concerned about making every road trip stop prestigious, we recommend the underpopulated Jersey side instead. 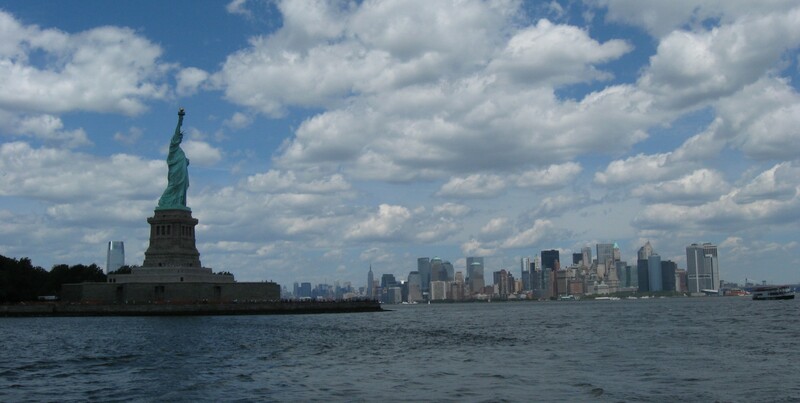 Takeoff from Liberty Island and waving farewell to that welcoming colossus. 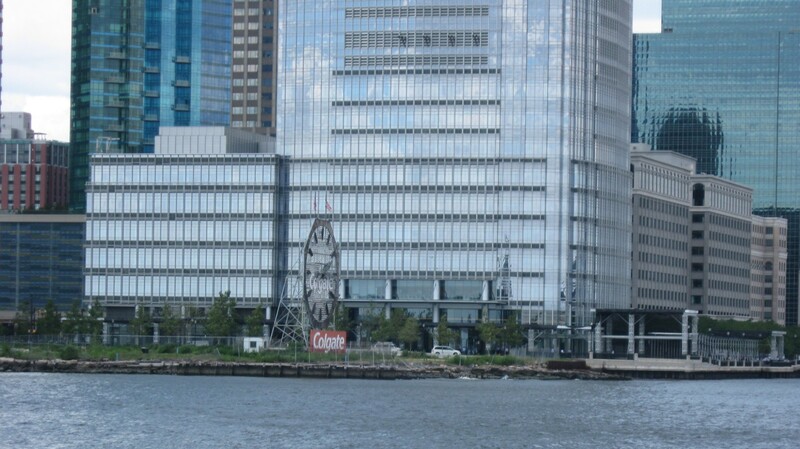 On the return trip to shore, we had a poor sight line to the Colgate Clock, which Wikipedia says is the fourth-largest clock in the world as of 2010. It’s actually the second clock built by Colgate. The first one, a bit smaller, is 100 miles from our house, down in Clarksville, Indiana. Movie fans can also catch a glimpse of it in The Insider. 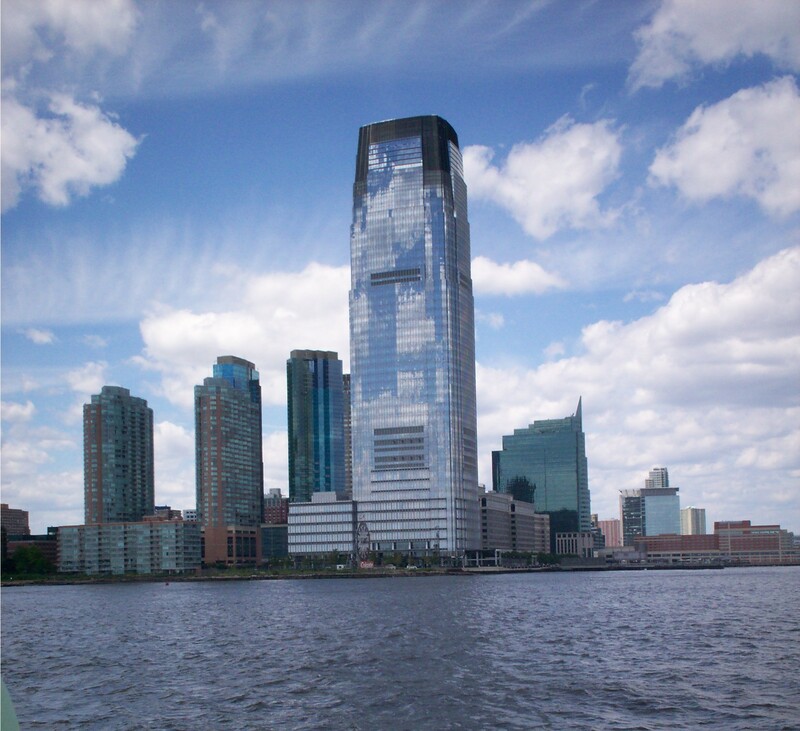 That background structure looming behind the clock is New Jersey’s tallest skyscraper, the Goldman Sachs Tower. Their owners are in charge of the clock’s upkeep and thankfully resisted the urge to pawn it and pay down their debts. You might remember them from such events as the 2009 recession and the much-derided government bailouts that occurred under President Obama’s watch. They’re also the bearers of one of the longest “Controversies” sections in Wikipedia history. Our return trip to the shore was spent in silence, each of us in separate parts of the ferry. Anne stood on the side facing Liberty Island, getting one last look at what we’d already seen. My son ignored the windows and found the nearest bench to rest the feet that ached right now. I stood on the side facing NYC and wondered what a future vacation over there might entail. Each of us chose our own private preoccupation — the past, the present, the future — just like the forefathers who arrived here a century earlier for their own diverse motivations, except ours would’ve made for a really cool triptych. One of our many random shots of Manhattan’s south shore, which includes the Brooklyn Bridge at far right. Liberty State Park upon our return was deserted, now that all Statue of Liberty trips were launched for the day. Back on shore, we picked up an Italian ice for my son and returned to the Jersey Turnpike. I tried to stop for gas, but their stations offered only old-fashioned full-serve pumps. I assume this wasn’t for the sake of nostalgia, but for security purposes. I can’t blame them. I wasn’t in a tipping mood, so I held off till Pennsylvania. Weeks after the trip, friends informed us this was New Jersey state law, apparently because their citizens can’t be trusted to handle gas pumps without turning into wanton criminals. Or something. We were exhausted by the time evening fell in Exton. Dinner was at a nearby Cheeseburger in Paradise, where my son ate two full servings of teriyaki wings and the waitress felt comfortable enough with her job security to take extended breaks between her infrequent stops at our table. Back at the hotel, a pair of police cars waited outside, lights flashing. Two officers stood on duty in the lobby, one of them positioned next to the coffee stand and toying with her phone. When I came down later to take advantage of some free decaf, she let me know some more was being brewed fresh and would be done shortly. 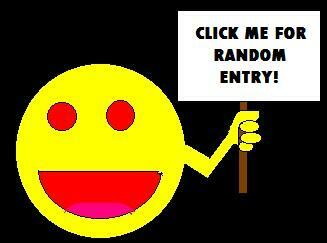 We exchanged two or three lines of small talk, but I retreated without asking her to divulge any useful info. Frankly, I didn’t want to know why their presence was required. If it was because of danger, it would ruin my night’s sleep. If it was because of coffee, then here come unfunny cop jokes. That night on TV: TNT rerunning Lord of the Rings: the Fellowship of the Ring, a film about a group of travelers with varying agendas united by a simple common goal and exhausted by a never-ending journey into smoky mountains and questionable establishments. 1. …and that’s the story of the moment when my son and I more or less decided our 2011 road trip would take us to the Big Apple. 2010 to the left of us, 2011 to the right of us.